I struggled with meditation for years myself. But once I found the right meditation technique for me, it’s been life changing: I’ve found more peace and calm and greater creativity. 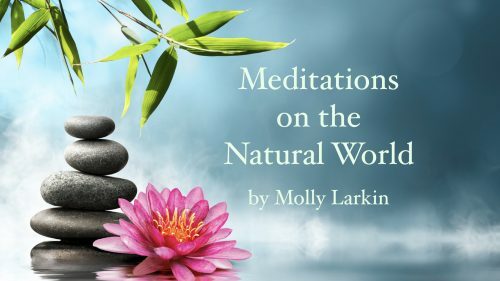 The course takes a unique approach to meditation, presenting a variety of meditation techniques that are surprising and fulfilling. Some of the techniques come from indigenous traditions and the natural world [water, trees, drumming, for example]. The course is three hours long, containing two hours of video plus pdf articles. The course is self-paced, meaning you can take it in one sitting, or take it over time. You have lifetime access. You can submit questions and comments in the course Facebook Group. Try a variety of meditation methods to find the technique that’s right for you. Learn how to create good habits. You will, naturally, have to try each technique to see if it resonates with you. And, of course, it comes with a 30-day money back guarantee. Here is a short video introduction to the course. CHECK OUT THE COURSE HERE and watch some of the preview lessons. I hope you’ll join me now during this initial half-price offer. To your health and peace of mind!